Linda Brown Driving School Linda Brown Driving School offers driving tuition in Runcorn, Widnes, Frodsham, Helsby and surrounding areas for complete beginners, learners with some experience, refresher courses, motorway driving and Pass Plus. 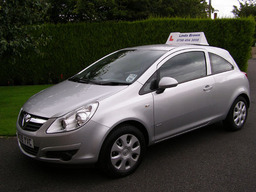 Linda Brown Driving School is an independent driving school whose instructor is approved by the Driving Standards Agency (Grade 6) and is also a member of RoSPA (Gold) and the DIA. Linda is also a qualified teacher with many years teaching experience. The aim of our Driving School is to teach safe driving for life, in a professional, relaxed and friendly atmosphere, with structured lessons tailored to meet the needs of the individual.